The academics found it, the four women from the University of Costa Rica combing through the woods for fungal samples. They were on their monthly visit to the Osa Peninsula rainforest outside Corcovado National Park, traveling the trails above La Leona Ecolodge to their designated sampling sites. One PhD candidate had told me the focus of her thesis was establishing fungi as indicators of climate change. 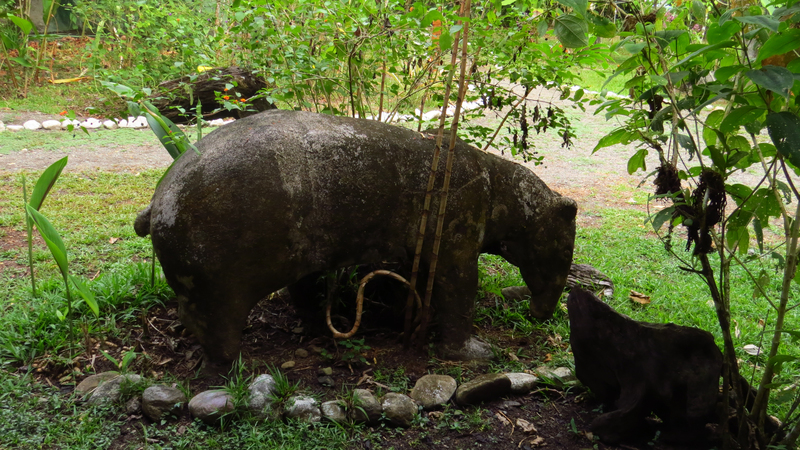 While the Osa Peninsula affords the best opportunity see a Baird’s tapir, I felt fortunate to encounter one so close. The staff at La Leona said one visited the open air restaurant one evening while they were cooking vegetables. Baird’s tapirs are shy mostly, as well as retiring. These odd-toed ungulates, distantly related to rhinos and horses, persisted for 35 million years little changed, eating vegetation and serving as critical seed dispersers and occasional food for jaguars and crocodiles. Indigenous peoples likely hunted them for food. Then came the scourge of deforestation for banana plantations and cattle ranching, along with waves of immigrants who increased harvest of tapirs. 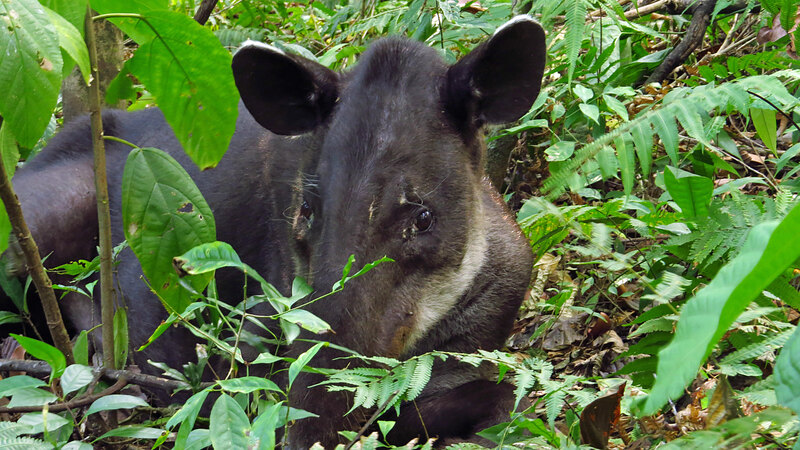 Costa Rica now hosts fewer than 1000 tapirs, and the number continues to fall due to habitat loss, hunting outside protected areas, and poaching. The tapir reproduces slowly, the second strike against its future. Gestation is a year before a single offspring is produced; another year or two passes before the young is sent on its way. Tapirs are largely solitary, dependent on forests with nearby water sources to wallow or wash in. They reportedly frequent the Sirena Ranger Station airstrip to graze on the disturbed area. Tapirs depend on habitat connectivity like grizzly bears, wolves, elk, bison, and other large North American land mammals. Even at 2.2 million acres (~890,000 hectares), Yellowstone National Park does not have enough habitat for the animals. Bison leave for better food sources come winter only to be killed when they step over the park boundary. Wolves travel with elk in hunting season and get harvested after they follow the elk past the invisible line that protects them. There simply isn’t enough space: the Yellowstone to Yukon initiative promotes development of a habitat corridor to correct the “island effect” . 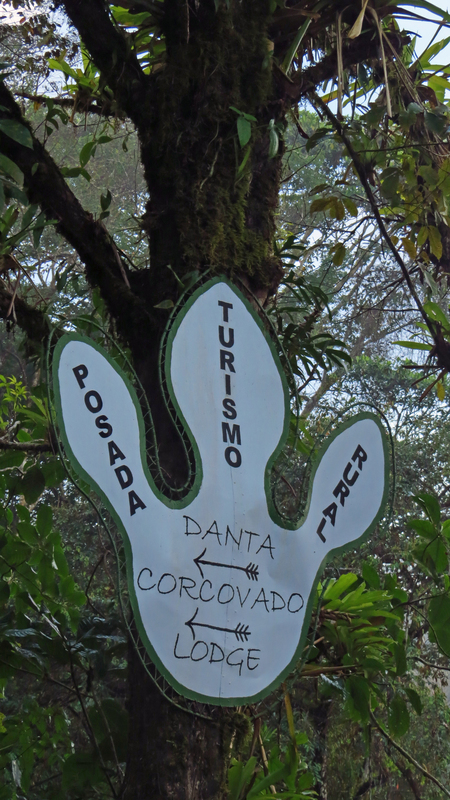 In Costa Rica, the Path of the Tapir Biological Corridor has the same goal to benefit tapirs and a host of other species that suffer from habitat fragmentation. Even the resplendent quetzal needs to travel, but forest fragmented for open cattle pasture makes it vulnerable to raptor predation as it flies from the cloud forest to the lowlands. We stayed at lodges that promote the project, and conservation. Hacienda Baru Wildlife Refuge and lodge was a wonderful treat of trails full of wildlife and a great conservation story to boot. 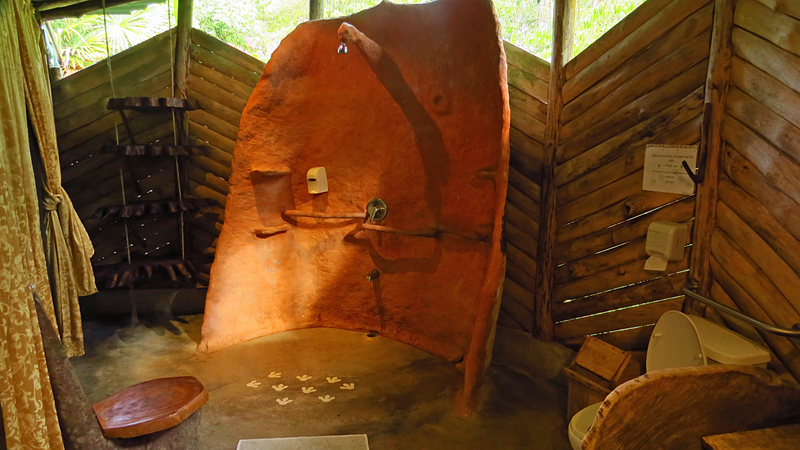 Danta Lodge has anti-skid danta footprints in the shower-of course! Danta Corcovado Lodge at La Palma is the most sustainable place we stayed, a truly magical, hand-crafted child’s dream of the tropical rainforest. The lodge is all things “danta”: a three toed danta footprint is the logo, silverware holders, candle holders, and even anti-slip patterns on the floor of the open air showers. Tapirs- not winning a beauty contest! Don’t judge my friend too harshly on that statement. Google “is conservation a beauty contest” and you will get an article from the Guardian reporting that scientists champion the beautifuland charismatic and neglect species that aren’t show-stoppers and therefore money-raisers . A former scientist turned science teacher has started a Tumblr site called “Endangered Ugly Things”. And there is the curious irony of the heroic rescue of the hideously ugly California condor while sending the more repulsive condor louse into an eternal night by delousing the last wild birds as they were brought into a captive breeding program. The Baird’s tapir isn’t cute like the panda, and doesn’t benefit from the charisma factor. It doesn’t run in massive migratory herds, or even multi-generational family units like elephants, with mysterious vocalizations and mystical associations with place and death. The tapir isn’t venomous, nor does it hunt in some spectacular fashion by tooth and claw: it is more a forest workhorse, fertilizing, tilling, and cracking and dispersing hard-coated seeds. In Costa Rica, the market sells what people would love and would save if it were threatened. Gift shops specializing in local artisan works have carvings, paintings, weavings of scarlet macaws, the resplendent quetzal, monkeys, blue morpho butterflies, toucans, and so on. In the wonderful Jagua Arts and Crafts in Puerto Jimenez, I struggled to find anything to honor my tapir encounter, and was about to give up after we combed the whole shop. My friend may not have been so enamored of the tapir, but she was determined that I should have a memento,so she asked the clerk if they had any tapir-themed item. The woman pulled open drawers of painted animal carvings, dug through the jaguars, monkeys, macaws, and even sharks, and finally found a single tapir carving. That was it for the whole store. On our last morning at La Leona, a guide ran up from the beach as we were all eating breakfast in the open air restaurant. “Come now!” he called. “There is a tapir on the beach!” We all ran down with the ever-handy cameras and binoculars and the guide set up his spotting scope. 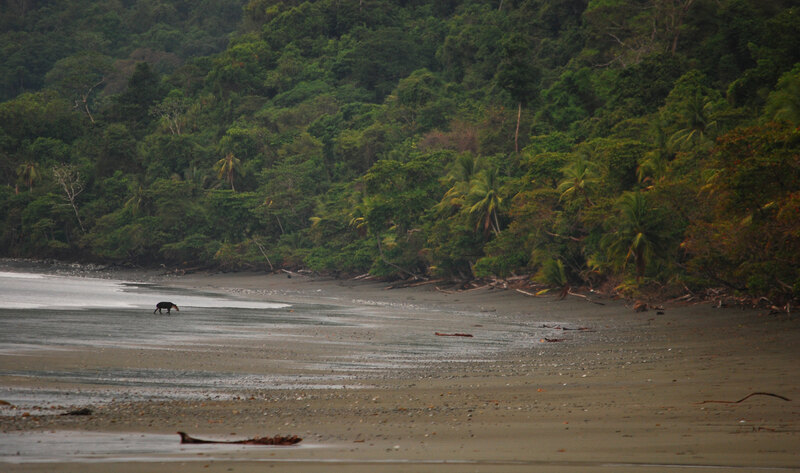 The animal was at a distance, walking slowly out of the surf and toward the forest. The guide volunteered that “the tapir takes the shower in the morning to remove the parasites, then it goes to bed in its forest during the day.” I smiled at the description, anthropomorphic perhaps for ease of translation, or for better understanding by the foreign tourist. Here we were, “glamping” in simple tent abodes with open air showers, no electricity and no hot water, but we still needed a domicile context to understand nature.